MUNYONYO– Ugandan singer and break dancer Kakooza Micheal alias Micheal Ross was last night December 1 ashamed when he was lifted and thrown off stage at the Annual Jonnie walker Soul – R& B concert at Speke Resort Munyonyo. 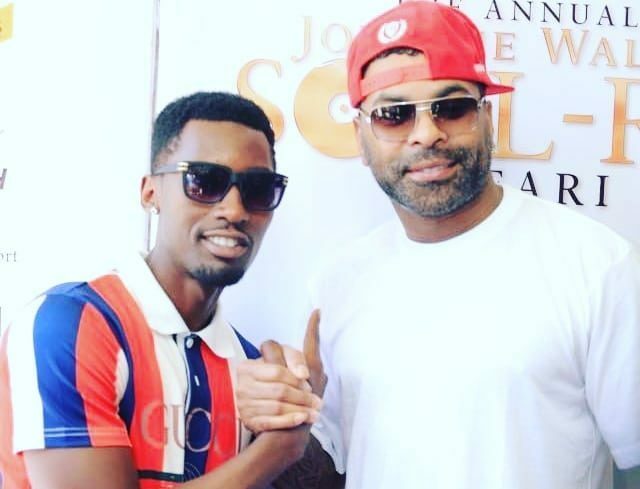 This was when an American soul singer Elgin Baylor Lumpkin better known as Ginuwine was live on stage performing when Micheal Rose jumped on to show his break dance. However, he was not granted a chance and was immediately lifted and thrown off stage by the angry bouncers. Ross was not among the performers of the night, however, because he had grabbed a small jazz with the international musician before the show, he probably thought they had become friends enough to share the stage. Ginuwine, who could have saved Ross from the disgrace by stopping the bouncers, instead kept laughing at the ashamed Ross. Later on, Ross walked straight to his friends who were down the stage.